HOFFMAN ESTATES, Ill., June 22, 2017 /PRNewswire/ -- Sears announced the grand opening of its first Sears Appliances & Mattresses store today. Located in Pharr, Texas, the latest innovative retail concept from Sears is a free-standing store dedicated to two of its strongest categories, while offering the power and capability of its leading integrated retail services. The new store builds on the success of the Sears Appliances store that opened in Ft. Collins, Colo. in 2016 – a location that has surpassed projections since its opening. 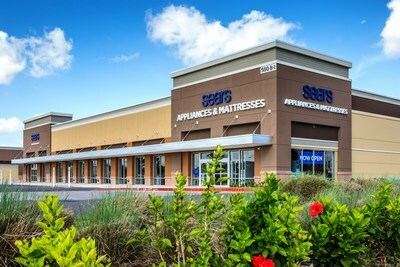 "Response to this new concept has been overwhelmingly positive – from member feedback to business performance – so expanding it to another key category like mattresses, and in an important local community like Pharr, made perfect sense," said Leena Munjal, senior vice president, Customer Experience and Integrated Retail, Sears Holdings. Located at 500 N. Jackson Road in Pharr, the 20,000-sq.-ft. Sears Appliances & Mattresses store features interactive displays that allow members to view home appliances in kitchen vignettes and experience top mattress brands. The store showcases the top 10 major appliance brands, including Kenmore®, in a bright, spacious setting. Members can visualize how new appliances would look in a full-scale kitchen with the "Discover More," 122-inch interactive digital display. Using a tablet, shoppers can select common kitchen layouts and appliances and further customize the experience by choosing colors and finishes. They also can use the "Discover More" digital display to shop for other products on sears.com. The Pharr store also features an assortment of vacuums, floor care and home environment products as well as countertop microwaves. In addition, members can try out mattresses from top brands, including: Tempur-Pedic®, Beautyrest, Sealy, Serta, Simmons and Stearns & Foster, and shop for select pillows and bedding at the store. "At our new Sears Appliances & Mattresses store, the community will find an innovative, interactive shopping experience that showcases our leading array of appliances and mattresses, with the support of expert associates," said Munjal. "Like our Sears Appliances store in Ft. Collins, this stand-alone location fully integrates in-store and online shopping to provide our members with the convenience of shopping with us wherever, whenever and however they choose. Only Sears offers the top 10 appliances brands, including Kenmore, and has the largest network of expert technicians who make managing your home easier." Free Shipping: Looking for a product that's not carried in the Sears Appliances & Mattresses store? Simply open the Sears mobile app, find the item you want – apparel, footwear, tools, lawn and garden equipment and more – and get free shipping on orders placed while in store (when location services are enabled). Buy Online and Ship to the Store, In-Vehicle Pickup: Members can purchase all products available on Sears.com or Kmart.com, ship to the store for free, then pick up their items at the store when they arrive, where they will be ready in five minutes, guaranteed. Members can even choose to have their item brought out to them by using Sears' innovative In-Vehicle Pickup service. Anyone, Anywhere Pickup: Members can order any item on Sears.com or Kmart.com and send a friend or family member to pick up the purchase – particularly useful for parents purchasing items for their kids who may be away at college. The new Sears Appliances & Mattresses store will be open Sunday 11 a.m. - 6 p.m. and Monday through Saturday, 10 a.m.– 9 p.m. In most cases, Sears delivers appliances and mattresses Monday through Saturday (dependent on zip code). For more than 50 years, Sears has been the home services and appliance expert. The Sears Appliances & Mattresses store's associates and technicians, who provide services such as installation, maintenance and repair, are trained and employed by Sears. Pharr members will also gain peace of mind knowing they can protect their purchases with one of the industry's most comprehensive warranty programs, which has made Sears No. 1 in protection agreements. For more information, photos and a video about the new store, visit Sears Holdings' blog post at: https://blog.searsholdings.com/leena-munjal/sears-appliances-mattresses-store-opens-in-pharr-texas/. *Disclaimers: HA: Advertised savings are valid in store only. (1) Savings range from 5%–40%. Whirlpool, Maytag, KitchenAid, LG, GE, GE Pro¬ le, GE Cafe, Frigidaire, Electrolux, Bosch and Samsung appliances limited to 10% off. (1, 2) Excludes Dacor, Floor care, sewing machines, countertop microwaves, air conditioners, air cleaners, fans, heaters, water heaters, water softeners, water ¬ filtration, humidifiers, dehumidifiers, Floor care accessories, home appliance closeouts and Everyday Great Price items. Mattress: Savings range from 50-60%.